Dear CES families, please remember that we will not have school tomorrow, April 19th or Monday, April 22nd. 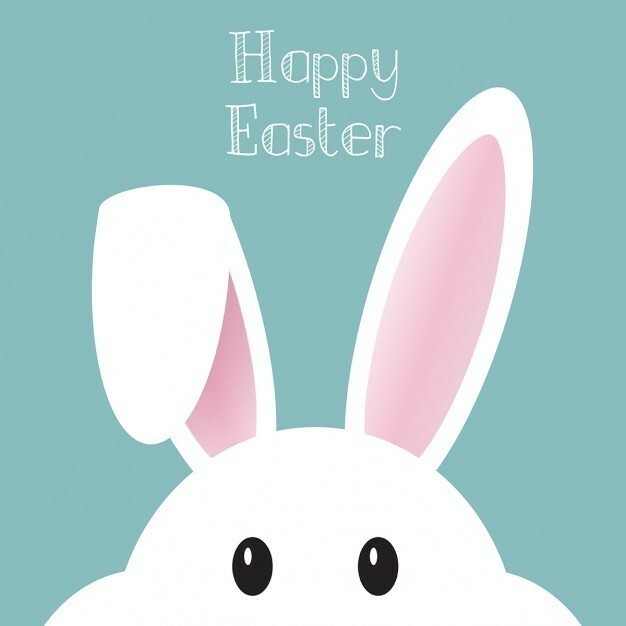 Enjoy your four day weekend and have a happy Easter! See you next Tuesday! We are so excited for our upcoming visit with children's author, Carol Robinson Baker. 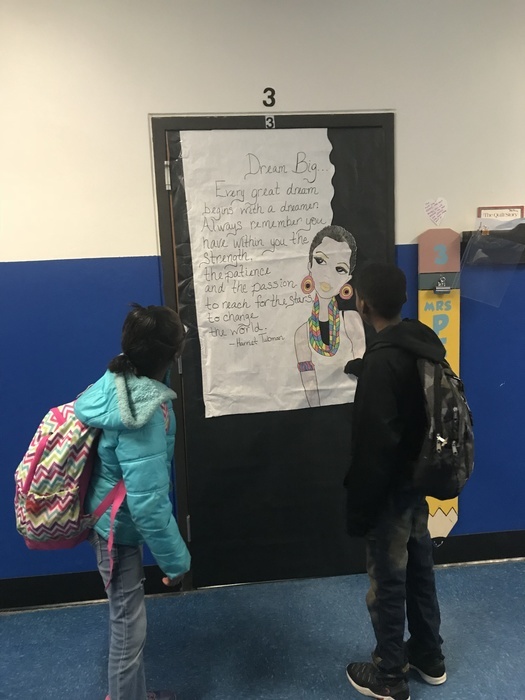 She will be presenting to our 4th grade students on April 5th! Children's author, Carol Robinson Baker, will be presenting to our students on April 5th! Pre-orders for books are due by April 1st so make sure turn in order forms. We are so excited for this upcoming event! Dear parents and students, we would appreciate your help with giving us feedback on our campus survey. Please use the links below to complete the survey, thank you! Parents: https://goo.gl/forms/ubZkdOW8svGIHHU23 Students: https://goo.gl/forms/KgWbv2Fnrae4hNO22 Surveys close 3/29. 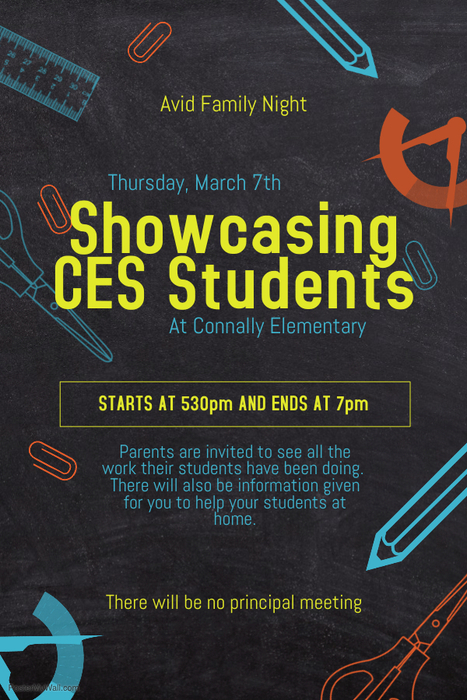 Tomorrow is our Connally Elementary Showcase from 5:30 to 7:00! Come out and enjoy light refreshments while looking at all of your students spectacular work! We can't wait to see you there! Hello CES family. Safety is a priority at CES. For those dropping of students in the morning, please make sure to stop at the stop sign in front of the cross walk. This will ensure the safety of students, staff, and crossing guards. Thank you for your support! 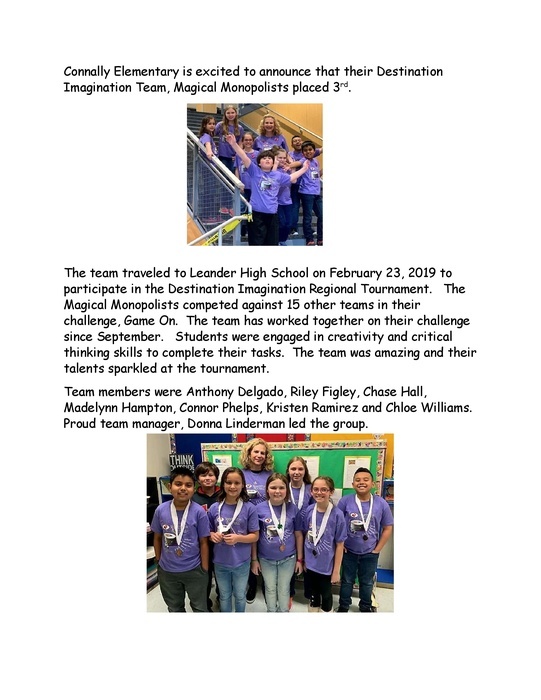 We are so excited to announce that our CES Destination Imagination team placed 3rd at competition! The team consisted of Anthony Delgado, Riley Figley, Chase Hall, Madelynn Hampton, Connor Phelps, Kristen Ramirez and Chloe Williams. We are so proud of all of their hard work!!! 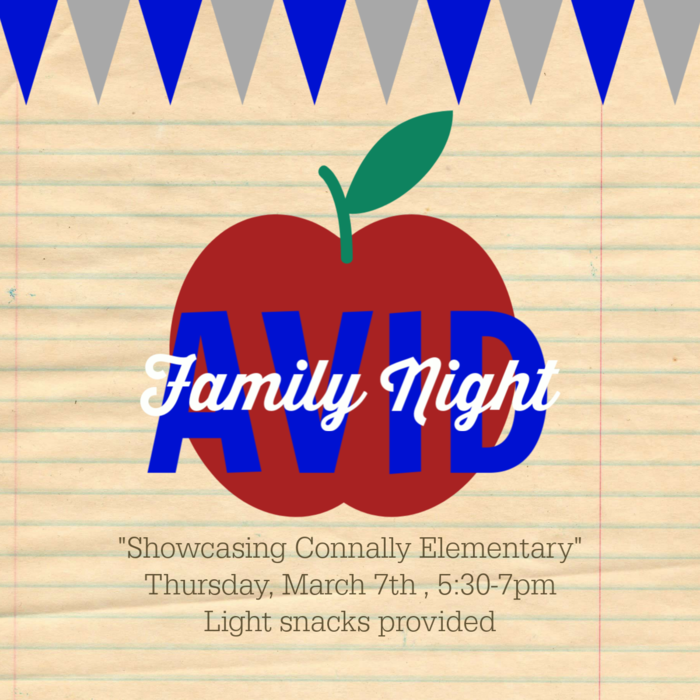 Next Thursday, on March 7th, we are having our AVID Night Connally Elementary Showcase! Come out and enjoy seeing all of your students hard work! You are invited to come to our CES campus from 5:30 to 7. Light refreshments will be provided. 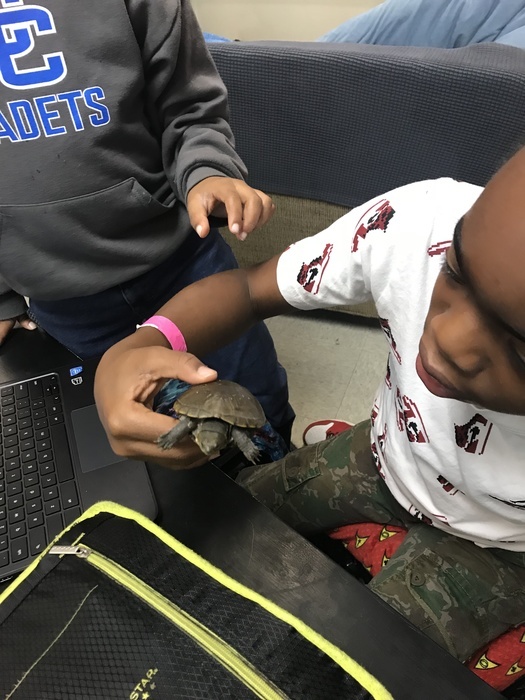 Parents, ask your CES student about the letter that was sent home with them today regarding the "Always Changing and Growing Up" presentation. Students read quotes aloud to each other from our Black History Month celebration! Happy Valentines Day from CES! 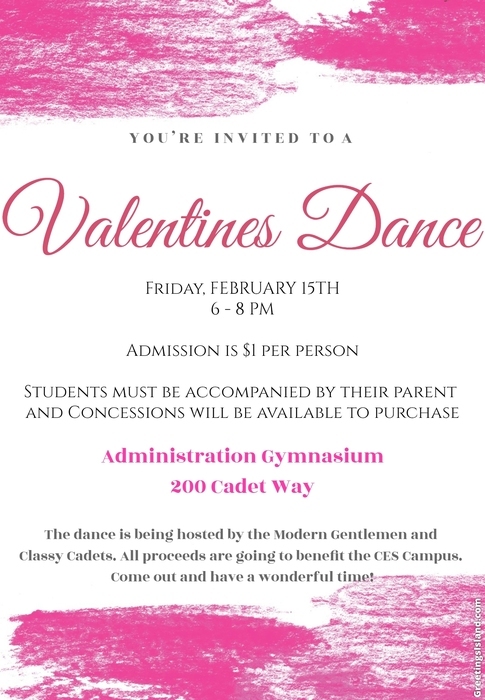 Join us tomorrow for our Valentines Dance from 6-8 pm at the Administration Gymnasium, 200 Cadet Way. Admission is $1 per person and there will be concessions available to purchase. Please remember students must be accompanied by their parent. Don't forget that this week is the Book Fair at CES! This is the perfect time to stock up on books for summer reading! 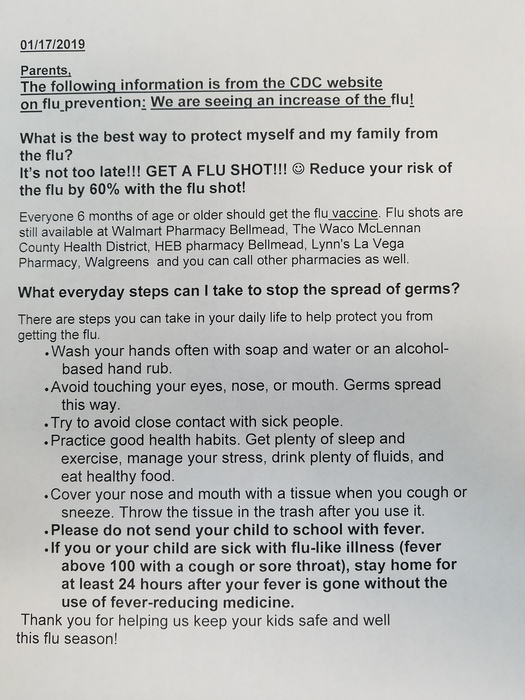 Please see the information about the flu. Be Safe and Healthy. Correction: Group pictures on Thursday, January 31st. Tomorrow, January 30th, is group picture day at CES! Get ready to smile for the camera! If you have a student in Girlstart, meetings start again today from 3:30-4:30. Hello Connally Elementary School staff and families. This is a reminder that we are closed on Monday, January 21st in observance Dr. Martin Luther King Day. 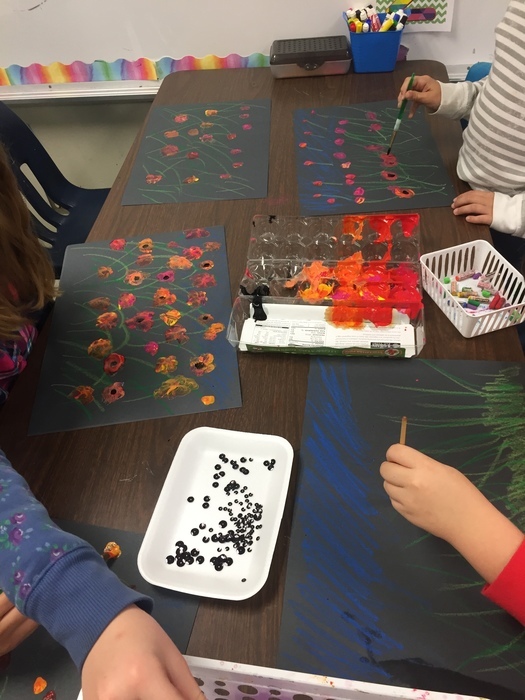 All regular instructional activities will resume as normal on Tuesday, January 22nd. Thank you and have a great weekend. We can't wait to celebrate students' positive behavior with our PBIS Wonderland tomorrow! CES Parents, tomorrow is an early release day so dismissal will begin at 12:00 pm. We hope you all have a Merry Christmas and a safe holiday! Friday is ugly sweater day! We will be having an ugly sweater contest so dress in your favorite festive sweater! Don't forget to wear your favorite winter PJs to school on Thursday for pajama day! Don't forget to come out tonight, from 5:30 - 7:00 pm, for our CES Christmas AVID Family Night! There will be fun prizes, carnival games, food, cookie decorating, a photo booth, and even Santa! Come have a very merry time! Tomorrow come to school wearing red for Rudolph or green for the Grinch! 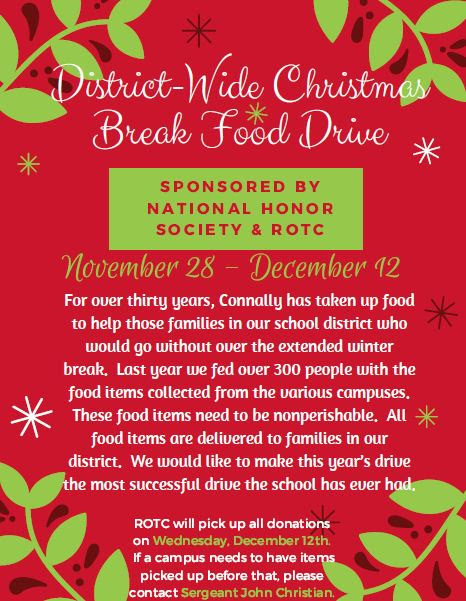 Please send donations for our annual Christmas Food Drive! We are accepting any nonperishable food items or money to purchase perishable items. The CES homeroom class that collects the most donations will receive a Pizza party! 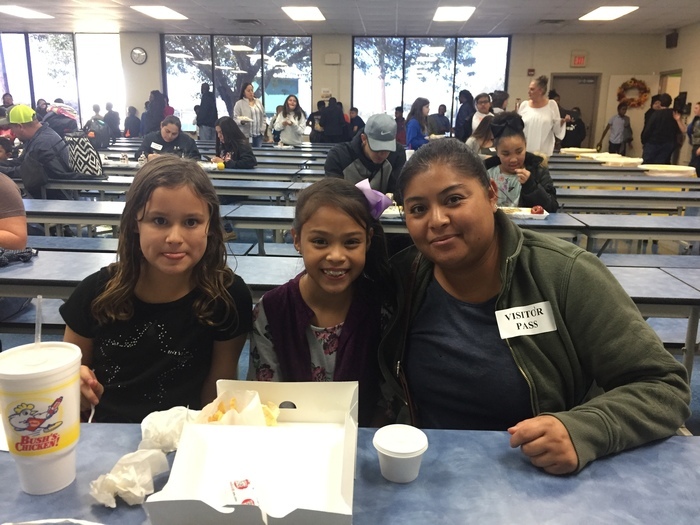 We are so grateful for the outpouring of family support during our Thanksgiving Lunch! Thank you for attending this special event! 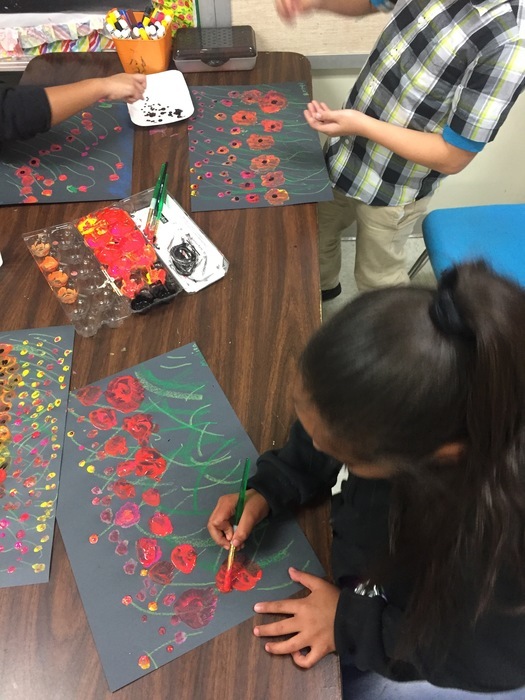 Our 4th and 5th grade artists are working on poppy fields in honor of our countries veterans this week! 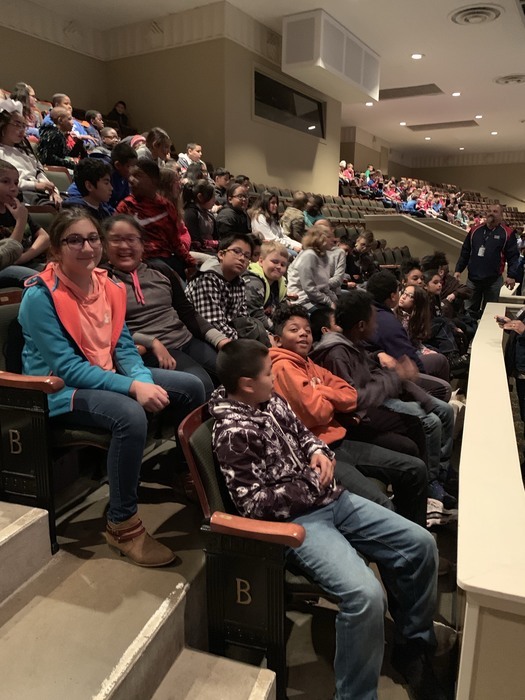 We are so excited that our awesome 5th graders were able to experience the Baylor Symphony! Tomorrow is Thanksgiving lunch at CES! The price is $3.75 for anyone who isn’t a student and it must be paid in either check or cash with exact change. Come out an enjoy a wonderful turkey feast with all the trimmings! 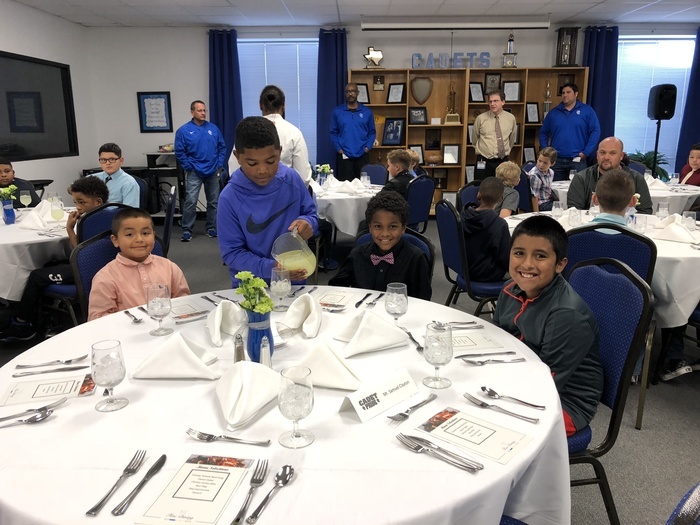 Thank you to everyone who made our Modern Gentlemen ettiequte lunch a success! 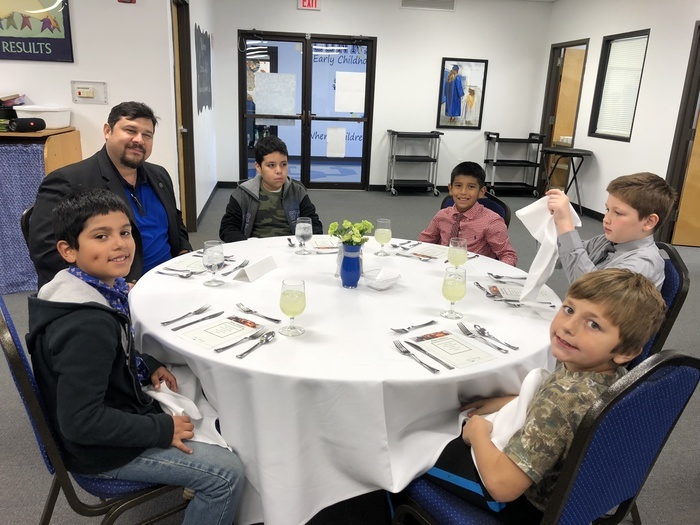 Our 4th grade Modern Gentslmen did a wonderful job modeling ettiequte. We are so grateful to have a program like this and for the staff and administration that support it! CES Parents, come out tonight for our Parent's Night at the Book Fair from 5:30 - 7:00 pm. Don't forget that tomorrow is Parent's Night at the CES Book Fair! You are invited to come and enjoy shopping with your children from 5:30 - 7:00 pm. Can't wait to see you there! Tomorrow is Grandparents Day at the Book Fair! All grandparents are invited to come during lunch and shop at the Book Fair with your grandchildren. Hello CES community. Wednesday is our "Grand" Day at the Book Fair. Grandparents, come have lunch with your grandchild and visit the "Grand" Book fair while you are here. We would love to see you! Our Book Fair open all week from 8:00 am to 3:00 pm! Parents, don't forget that our book fair starts next week! There will be many amazing books available to purchase! Parents come out to our High School Fall Festival tonight from 6p to 8p. There will lots of fun filled family activities! Next week is Book Fair time at Connally Elementary! - It is open M-F from 8:00 am to 3:00 pm. 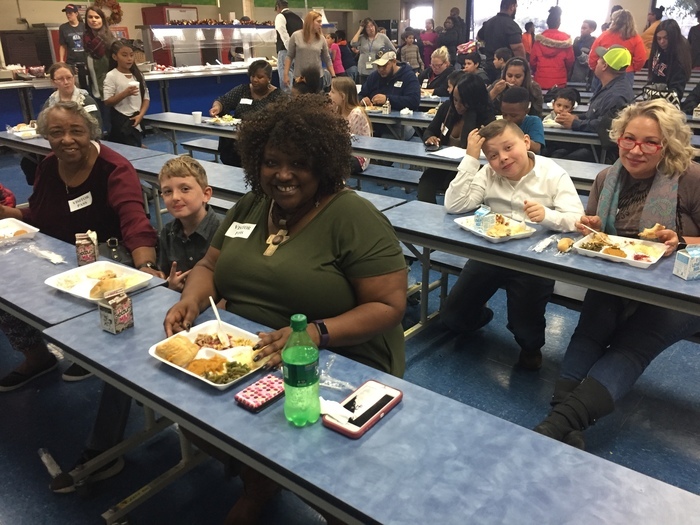 - Wednesday is the "Grand Event" where grandparents can come shop and eat lunch with their student. - Thursday is Parents Night and you can come shop from 5:30 to 7:00 pm! 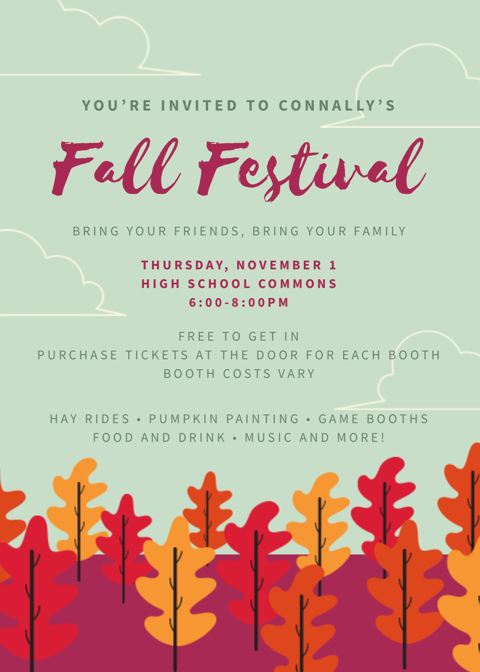 Come support our High School Fall Festival. CES parents, please remember we are not allowing costumes tomorrow. Thank you for understanding. Don't forget that tomorrow is Picture Day for CES! Hello CES Family. I wanted to make sure everyone is aware of a couple of things. Picture day in tomorrow, Tuesday, October 30th. Also, no costumes will be allowed on Wednesday October 31. Thank you for your support and understanding. Sincerely, Mr. Cantu. 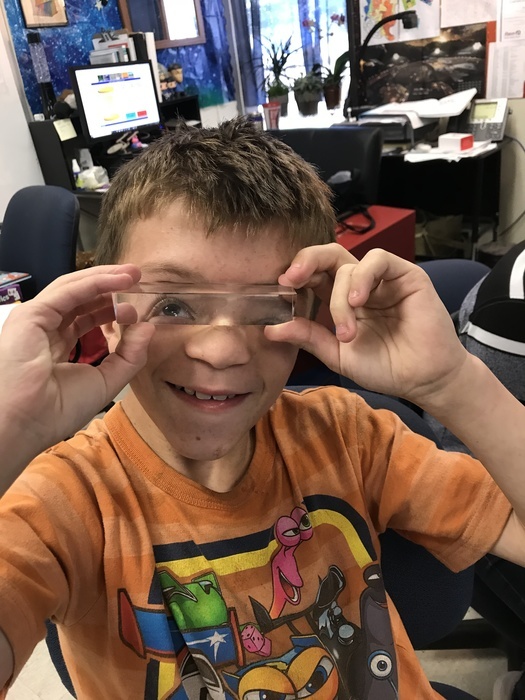 Learning science is always fun at CES! We say NO to drugs at CES! Don't forget to come out tonight for Connally Elementary's AVID Family Fright Night from 5:30 - 6:00! Remember to wear your tie dye on Friday for Red Ribbon Week. Remember to wear your favorite team jersey for Red Ribbon Week! We love celebrating our amazing principals at CES! Remember to wear your crazy socks tomorrow for Red Ribbon Week! Don't forget that AVID Family Fright Night is this Thursday! It is from 5:30 - 7:00 PM on October 25th. Come wearing your costume and have some spooky fun! Remember that this is Red Ribbon Week! Tomorrow put a cap on drugs and don't let them sneak up on you! Wear your favorite cap and sneakers. 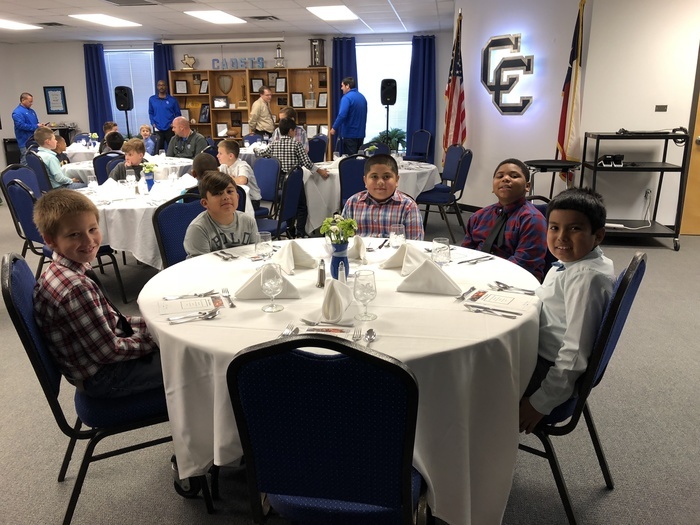 From Connally Elementary School. The Modern Gentlemen Car Wash and Classy Cadets bake sale has been cancelled for today due to weather. We will reschedule. Thank you for your support. Modern Gentlemen will still go to the game tonight. Drop off at 6:30 and pick up at 9 pm. We'll be highlighting all the big news and exciting classroom events from all over the school! Welcome to our new Elementary School website!